HAVE YOU EVER KNOWN SOMEONE WHO WAS AFRAID THEY COULDN’T GO TO HEAVEN? That was Martin Luther’s fear, more than 500 years ago. How could he ever know whether he had done enough good works to ensure eternal life with Jesus? Thank God that the Holy Spirit led Luther to study the Bible, where he found the Good News that Jesus had already paid the full price for all his sins – the sins of all people, everywhere – when He died on the cross! But all around the world, there are people still waiting to hear this sweet Gospel. Though Luther was a Christian, people living in the Buddhist, Hindu, Muslim and animist religions share his same fear: How will they ever do enough good things to get into heaven? YOUR STUDENTS CAN TELL OF GOD’S LOVE TO CHILDREN ALL AROUND THE WORLD! 500 years ago, Martin Luther knew his people needed two important things: the Bible translated into their own language, and a Small Catechism to help them understand it. Today, kids and families all around the world need these same things! Like Luther translating the Bible into his people’s German tongue, your students’ mission offerings help LHF to translate Luther’s Small Catechism and Bible storybooks into the languages of children around the world. Working with our Lutheran church partners and missionaries, LHF gives these beautiful full-color Bible books, free of charge, to the churches and families who need them. Even the smallest schools and classrooms can make a BIG difference! Our American dollars go a long way overseas, where it costs just $5 each to print a beautiful, full-color Bible storybook. Just think: Your students’ mission offerings of $50 give 10 children their own catechism or Bible storybook. $100 is enough to supply a whole classroom of children with books about the one true Savior, Jesus Christ! Free Continuing What Luther Began resource kits will be available and shipped Priority Mail. To order a kit, click here to send an email request, or call the LHF office at (800) 554-0723. 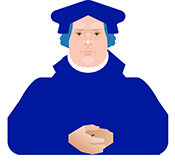 For links to LHF’s resources for the “Continuing What Luther Began” children’s mission project click here.